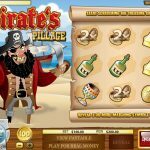 Pirates Pillage is a scratch card game that takes place on a small island in the middle of the Pacific Ocean. It’s created by RivalGaming. Here users will be able to choose their bet and then click new card to find out what lies as treasure. This game’s visuals are one of its biggest selling points. The background is designed in a cartoon format with a pirate’s ship, the ocean, the blue sky, the Beach of the island, the captain himself and his parrot all being displayed in the background. Users feel immersed into a world long Lost. Users only must choose the value of their coin and then click new card to start this game. The coins begin at the cost of $0.01. There are eleven different coins of a higher value. The highest coin is listed at $100.00. Players then must scratch the card with their mouse or click reveal to see if they’ve won. Users win this game by matching three of the same symbols. There’s an alcohol bottle, a compass, telescope, golden coins, glass and cold card. Each of the symbols has a different multiplier that’s applied to the value of your triggering bet. 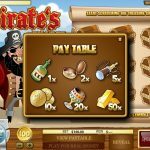 The bottle has a 1x multiplier, the compass a 2x multiplier, the telescope has a 5x multiplier, golden coins have a 10x multiplier, the drinks provide a 20x multiplier payout, and golden bars provide a 50x multiplier payout. This means that this virtual scratch card has a top prize of $5,000.00. 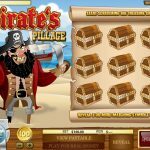 Pirates Pillage is a game that gives you what you want out of a virtual scratch card. It offers an environment that’s expected but little else. While it offers some high valued prizes, it offers little else. Yet, for those who enjoy scratchcards, it is a nice theme, and its graphics/images are appealing and well constructed.